President Donald Trump called himself a “nationalist” while addressing a campaign rally for Sen. Ted Cruz in Texas on Monday. The news comes as Trump has increasingly used the same type of “us-versus-them” rhetoric on immigration that he used during the 2016 presidential campaign in order to encourage his supporters to vote in the midterms November 6. Trump leaned into that over the weekend amid the news that a group of roughly 7,000 migrants were headed to the US from Central America. Cruz, the junior senator who took office in 2013, is in the middle of a closely watched Senate race in Texas against Democrat Beto O’Rourke. President Donald Trump on Monday declared himself a “nationalist” at a campaign rally in support of Sen. Ted Cruz in Texas. “You know they have a word, it sort of became old-fashioned, it’s called a nationalist,” Trump said. The crowd inside the Toyota Center in Houston cheered wildly. 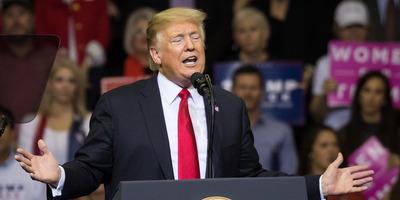 Trump’s remarks on Monday night illustrate the type of rhetoric he has used recently to encourage supporters to vote in the upcoming midterm elections. That rhetoric has centered around immigration and echoes the same type of “us-versus-them” ideology he used during the 2016 presidential election. Trump reaffirmed his tough stance on immigration amid news that a group of roughly 7,000 migrants from Central America is headed to the US seeking asylum. To that effect, Trump has threatened to cut aid to Honduras if it didn’t stop the migrants from heading to the US. Cruz referred to the group of migrants on Monday as a “serious” threat. “When you see thousands of people pledging to come violate US law, to cross into this country illegally, we have to treat that seriously,” Cruz told local reporters outside of a Texas Oil and Gas Association forum in Houston. Cruz is in the middle of a closely watched Senate race in Texas against Democrat Beto O’Rourke, whose message has struck a chord with the state’s progressive voters. Though Cruz is favoured to win, O’Rourke has raised more than $US38 million in the third quarter from more than 800,000 donors. The Houston Chronicle’s editorial board, which endorsed Cruz in his previous bid for US Senate in 2012, threw its support behind O’Rourke Friday. The board said Cruz has not acted in the interest of his fellow Texans during his time in office.